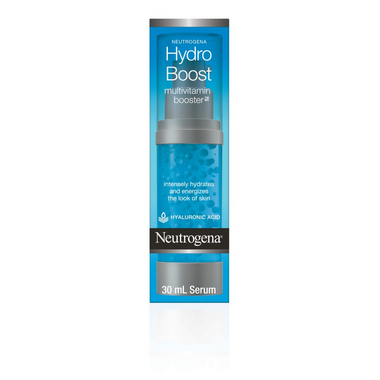 Can be mixed with your favorite Neutrogena Hydro Boost moisturizer for a hydration boost. Purified Hyaluronic Acid: Naturally found in skin, hyaluronic acid acts as a sponge for dry skin, absorbing up to 1,000 times its weight in water. This serum with Vitamin E Capsules helps energize and revitalize the look of dull, tired skin. Usage: Apply after cleansing and before moisturizing your face. Or mix with your favorite moisturizer. For an added boost of hydration, use together with Neutrogena® Hydro Boost Cleansing Gel, Serum and Gel Cream.